Sometimes life has great symmetry. Single events occur minute to minute, hour to hour, day to day that seem so random. But when you take a moment to step back and place them into the proper context – it becomes apparent that there is in fact a rhyme and a reason. 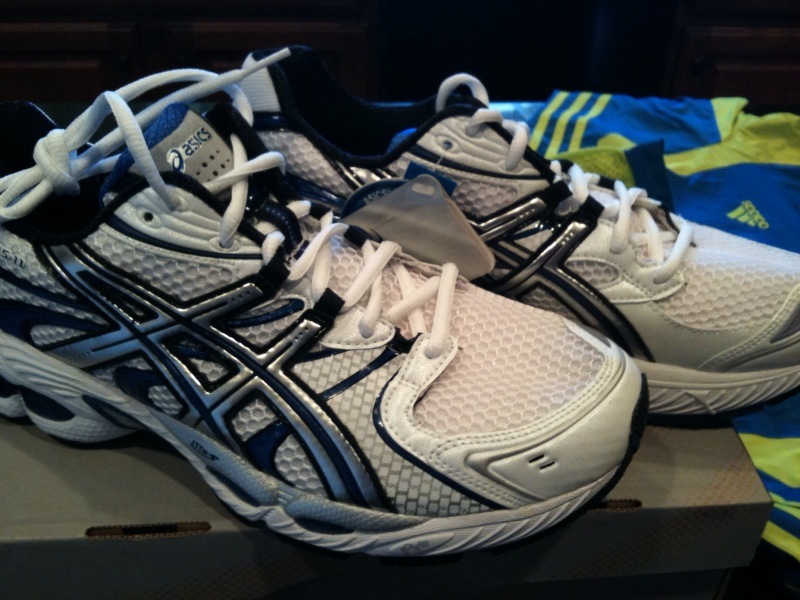 Boston Marathon Race Shoes Arrived This Week! Just yesterday in this space I was talking about how certain numbers can evoke very powerful images. How just the mention of the number 20 to a marathoner brings to mind memories of the longest “test” in their marathon training plan – the 20-mile long run. It is this “magic 20-miler” that provides the steepest challenge on the way to their ultimate test – the marathon distance itself – 26.2 miles. In training last year to reach my goal of qualifying for the Boston Marathon “the number” that I carried around with me on every training run was 7:37 – 7 minutes, 37 seconds. If I was able to average that time over 26.2 miles I would meet the qualification requirements for my age group of 3:19:59 and earn a spot in the 2010 Boston Marathon. It was a powerful number for me. It stared at me from my dry erase board in my office every morning. Each training run was compared to that pace. Was I fast enough? Was I strong enough? Could I be doing more? Could I train harder? Did I want it badly enough? And of course the biggest question of them all – Could I actually do it? Regular guy running for less than 5 years, could I? Boston? Really? I’ve had numbers before. Back in 2006 in my first ever marathon in Philadelphia I wore bib number 3650 – that was a pretty big deal. In Pittsburgh last year I ran wearing 2506 in making my Boston time – that number worked out pretty well. Wearing 1198 this year at the Austin 3M Half Marathon I set a PR with a time of 1:32:13. I won my age group (and two others!) 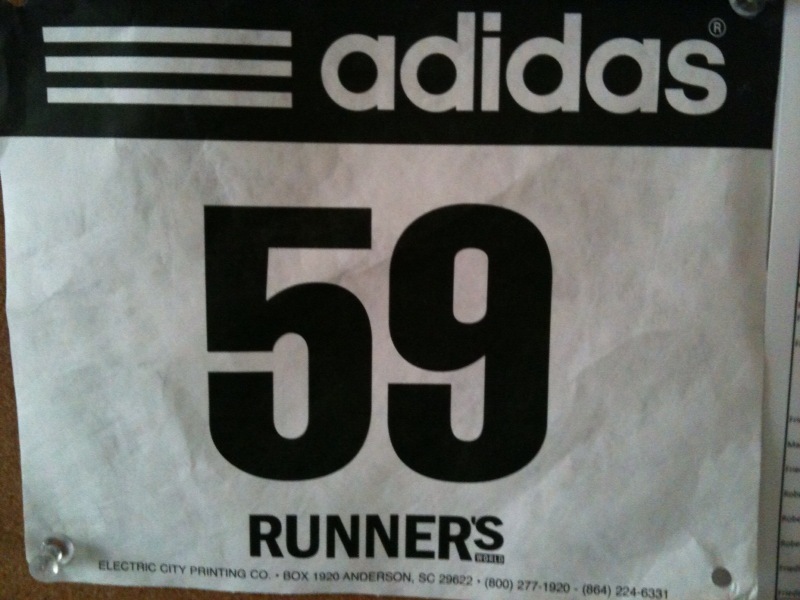 wearing number 59 at last year’s Holland, TX 5K – that was a great number. But 7929 …. Now that one is special. At most races your bib number doesn’t mean a whole heck of a lot unless you are one of the elite men or women invited to race. In those cases your number represents a “seeding” so to speak, where number 1 is the most heavily favored runner, followed by 2, 3, 4 and on down the line. At big international races the elite men and women do not receive numbers, instead they simply have their last name on their Bib – you see the names – MERGA, CHERUIYOT, HALL, KOSEGEI, TUNEI, GONCHAR etc. 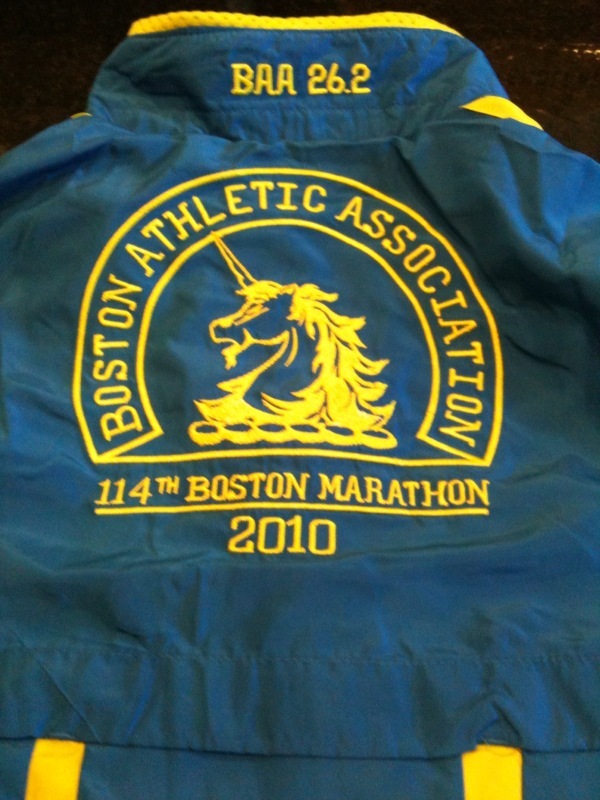 But for the rest of us at Boston your bib number is a big deal – as virtually the entire race is “seeded”. Because all but the charity runners who are asked to run at the back of the field have run a qualifying time to gain entry into the race – all runners are placed in starting corrals based on their Boston Qualifying Time. 25 Corrals with 1,000 runners each line up in Hopkinton, MA on race day and take to the storied marathon course with runners of similar capabilities in their group. This allows for a “relatively” even start to the race without faster runners being slowed by slower runners ahead, or slower runners being swallowed up by those trying to race past them. Bib number 7929 places us in the 7th starting corral. So in a lot of ways I made it into that grouping by a narrow margin – by only 71 runners. That’s O.K. – I’ll take it. There are a lot of things that have to occur between now and April 19th to run a good race at Boston in honoring Dom. We have to finish our training. Stay injury free. Take good care of our body during the taper period and watch our nutrition. Once training is completed we have to make a trip out east to Boston. We must hope for and receive good weather from the race gods on race day. Then finally – we have to trust our race plan, our training, preparations and go out to make good on the first leg of Run for Dom. 2 marathons, 2 weeks 4 Dom. That was where this all started back in August and with a little more than 4 weeks to go before Marathon number 1 – we received our first bit of good news. 7929 – Wave I, 7th Corral. Over the last five Boston Marathons 7929 has been worn by Rob Spears of Rocky Hill Connecticut, 3:16:05, James Montimbeau of Atlanta Georgia, 3:54:08 as well as Rafael Aburto of Mexico City, MX 3:32:45. In 2006 Michel Touboul of Dijon, France wore number 7929 finishing with a time of 3:47:36 and in 2005 Bob Crosier of Ravema, Ohio finished with a 3:29:52 time finishing 3,335th. 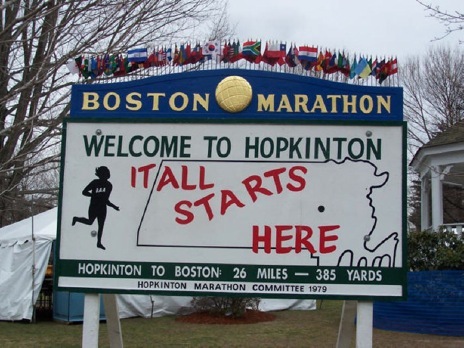 In the 114th running of the Boston Marathon 7929 will be on the streets from Hopkinton to Boston once again. Will I ever find my way back to Hopkinton? Boy I hope so, but what I do know is that we’ll be there on April 19, 2010 – and 7929 plans on leaving an impression.